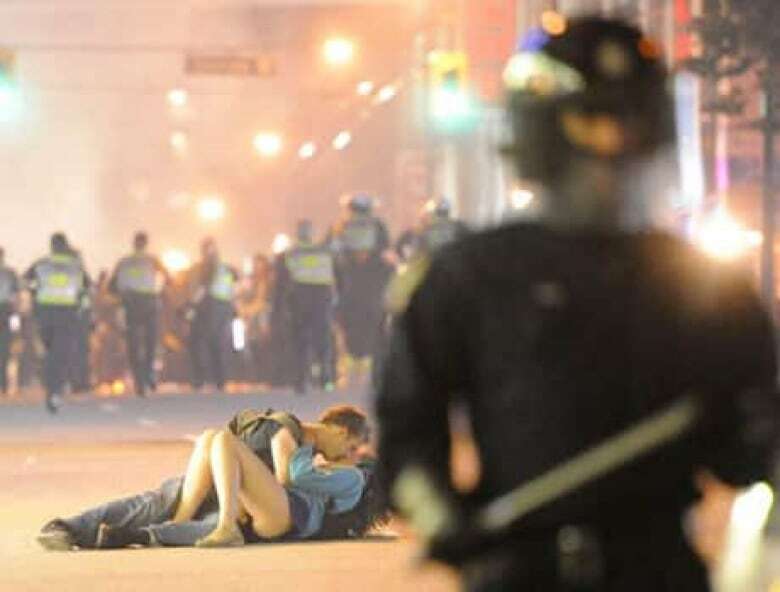 Scott Jones says he was just trying calm his girlfriend down after they both had been beaten on by Vancouver police when the now-famous photos of them lying in the street was taken in the midst of Wednesday night's riot. "They started beating us with the shields, like trying to get us to move," Jones told CBC News in an exclusive television interview Friday. "We weren’t being aggressive towards [police] or anything like that. But eventually they passed over us. And that’s when we were on the ground. She was a bit hysterical afterwards, obviously, and I was just trying to calm her down," said Jones, 29, an Australian who’s been in Canada for six months. Alex Thomas said she wasn’t sure how she fell, although a witness has told CBCNews.ca that the Canadian woman was hit first by rioters and then pushed over by riot police trying to clear the street after rampant vandalism and looting spread through the downtown streets following the Vancouver Canucks' Game -7 Stanley Cup loss to the Boston Bruins. "Tripped up? I’m not sure. I was starting to get really frightened because I’d never experienced anything like that before, and it’s really scary," Thomas told CBC News. "I was upset, and I fell down, and didn’t really know exactly what was happening." Jones said they had been trying to get out of the downtown area but found themselves on a street filled with police in riot gear. "They were literally charging at us and we tried to run away," he said. Neither Thomas nor Jones blames the police for what happened, but understand they were in the wrong place at the wrong time. The 'Kissing Couple,' Alex Thomas and Scott Jones, told their story to CBC News Friday. CBC (CBC)"[The police] were doing their job," Thomas said. Jones has been working as a bartender and trying to break into acting and standup comedy. At least one of his comedy routines has been posted on YouTube. Following the Canucks' loss to the Boston Bruins, images of the kissing couple surrounded by riot police were splashed around the world. On Twitter, Facebook and other social media, there was early speculation that the picture was staged. CBC.ca immediately launched a search to uncover the identity of the two. Hannah Jones, Scott's sister from Perth, told CBC News earlier Friday in an email that the man in the pictures is her brother, and he recently started dating Thomas, a former student at the University of Guelph in Ontario. The two are overwhelmed by all the coverage the picture has gotten, she said, fielding calls from media around the world. Riot town: Why did Vancouver lose its cool again?